The Senate voted 74-18 to confirm Carla D. Hayden, who leads Baltimore’s public library system, as the 14th librarian of Congress. Sen. Roy Blunt, R-Mo., rushed Hayden’s nomination to the floor even as Blunt’s office declined to answer The Daily Signal’s inquiries Wednesday morning about the status of the nomination. 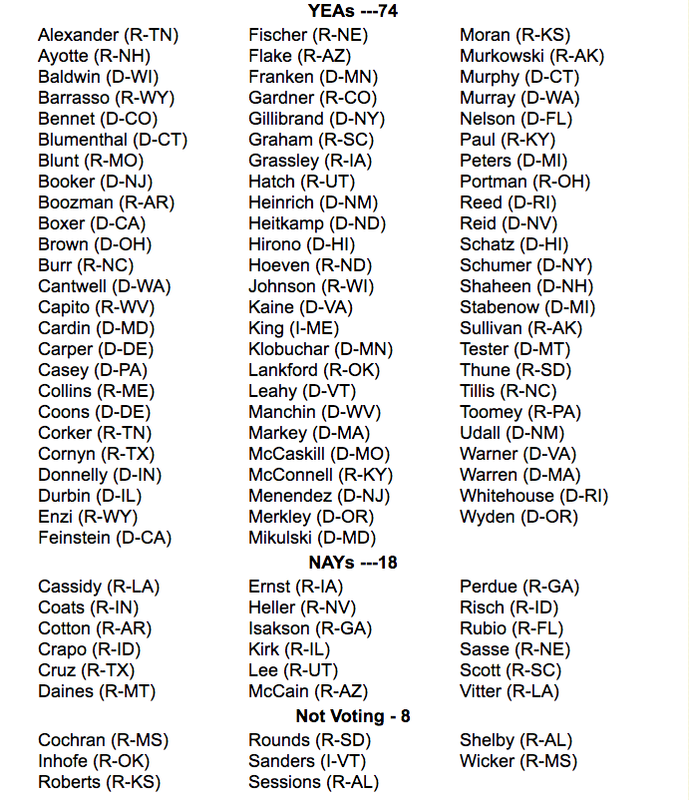 All 18 senators who voted no on Hayden are Republicans, as are seven of the eight senators who did not vote. Critics said Hayden falls short of the scholarly credentials traditionally expected of the nation’s librarian of Congress. However, Blunt, chairman of the Rules and Administration Committee, scheduled a June 9 committee vote that recommended Hayden’s confirmation to the full Senate. “Republicans should be very concerned about what her confirmation could mean for the Congressional Research Service, which is the research arm from which they get unbiased, nonpartisan research,” von Spakovsky told The Daily Signal. “This is someone so far to the left that The Nation magazine ran a headline when she was nominated about how a ‘radical librarian’ may soon run the Library of Congress,” von Spakovsky said in an interview just hours before Blunt’s unexpected move to bring the nomination to the Senate floor. Hayden, 63, succeeds James Billington, an appointee of President Ronald Reagan who served for 28 years before retiring last fall. Last week, a Blunt aide told The Daily Signal that no confirmation vote on Hayden was scheduled. But some conservatives were worried Blunt would organize a confirmation vote before Congress leaves town Friday for summer recess. I will be honored to build on the legacy and accomplishments of my predecessors in this position, to be part of a continuing movement to open the treasure chest that is the Library of Congress even further and to make it a place that can be found and used by everyone. In its voice vote June 9, the Rules Committee approved Hayden, former president of the American Library Association, for a 10-year term as the 14th librarian of Congress. After Billington’s resignation, Obama signed a bill in November that changed the position from a “lifetime” appointment. The Library of Congress, with an annual budget of $630 million and about 3,200 employees, controls the nation’s Copyright Office as well as the Congressional Research Service. The library also provides members of Congress with legal advice. Although Hayden may be qualified to serve in the public library system, the librarian of Congress is a unique, distinct position that should be occupied by well-credentialed scholars and authors, Heritage’s von Spakovsky told The Daily Signal. Unlike prior occupants of the post, Hayden is not an accomplished author and her experience is primarily as a local librarian, von Spakovsky and other conservative critics say. Hayden, who Obama noted would be the first black and the first woman to serve as librarian of Congress, is CEO of the Enoch Pratt Free Library in Baltimore, a position she has held since 1993. She received her doctorate in library science from the University of Chicago. By comparison, Billington has authored five books and dozens of scholarly articles, and taught history at Harvard and Princeton. In light of its past challenges, it is a relief to see that an institution as important as the Library of Congress will be run by an experienced administrator with a deep understanding of information management and a track record of managing information technology and modernization efforts. While some conservatives were obstructing her confirmation to score a few cheap political points, this effort had no clear goal or end-game. And they were ultimately just shooting themselves in the foot. Comments Hayden made in a video touting her candidacy, produced by the White House, were of particular concern to those wary of her nomination. Her remarks, they say, demonstrated a lack of understanding of why the Library of Congress was created and its fundamental mission today. “She was talking in the video about the Library of Congress as if it were some local public library and as a place where you go to borrow Harry Potter books and where you have internet access to find jobs,” von Spakovsky said. Critics say the video, Obama’s nomination remarks Feb. 24, and Hayden’s background indicate she is less a scholar and more a political activist who could compromise the library’s neutrality and integrity. Dr. Hayden does not possess the credentials necessary to act as the librarian of Congress, as shown by President Obama’s decision to highlight her race and gender in his nomination speech, not her academic accomplishments. Additionally, Dr. Hayden has made a name for herself in the far-left community as a radical activist. This position is not one for radical activism, but for academic honesty and integrity. If President Obama wants to promote Hayden’s professional talents, her fervor for social work, and the community-spiritedness she has demonstrated during her time in Baltimore, he could make her the first head of his presidential library. It would be a suitable homecoming; Hayden and the Obamas first met through the public-library system in Chicago. The Library of Congress, though, is not the place for ideological agenda-pushing. It’s a place for serious, public-spirited scholarship, and much better candidates than Carla Hayden are available to facilitate that mission. “If confirmed, Dr. Hayden would be the first woman and the first African-American to hold the position—both of which are long overdue,” the president added. In his cynical statement nominating Carla Hayden to be librarian of Congress, President Obama cited her race and gender as her major qualifications, hoping that would immunize her from scrutiny. Obama’s plan worked and he has intimidated Senator Blunt into giving the nominee a pass. Hayden’s opposition to the Children’s Internet Protection Act, signed into law by President Bill Clinton in 2000, was cited by Concerned Women for America in an April 11 letter to the Rules Committee. The law also “required public libraries to install internet filtering software on their computers in order to qualify for federal funding,” the group wrote, and “did allow a library to ‘disable’ the filter for genuine research purposes or during use by an adult. The U.S. Supreme Court ruled in U.S. v. American Library Association that the use of a filtering device did not violate First Amendment rights so long as there was an option to turn it off. In 2003, Hayden also crossed swords with then-Attorney General John Ashcroft over the Patriot Act when the American Library Association opposed a provision allowing federal authorities to inspect library borrowing records to identify potential terrorists. Before the surprise floor vote, conservative analysts said they weren’t sure why Blunt was advancing a nominee who sparked strong opposition from conservatives. Blunt is acting like the de facto leader of the Democrats in the Senate. He’s taking on the role of [Minority Leader] Harry Reid, and he’s acting like a Democrat and doing Obama’s bidding on this nominee when there’s no Democratic pressure for this nomination. President John Adams signed legislation creating the Library of Congress on April 24, 1800. In 1802, President Thomas Jefferson signed a law establishing the post of librarian of Congress. This report has been modified to include statements from Carla Hayden and Zach Graves, and to add other details.